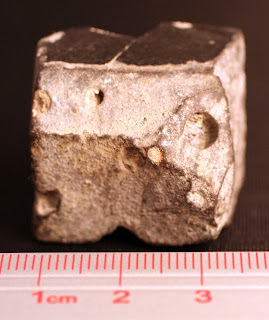 It dimensions are roughly 2.5 cm x 2.1 cm x 2.3 cm with a weight of 38.5 g. The side with the black coating is smooth but the side opposite that is rough (see next picture). The other sides are basically flat but coarse like a 200 grit sand paper. On the surface of a few sides are several small pot marks with diameters 1-3 mm. Closer view of side that attracts magnets. 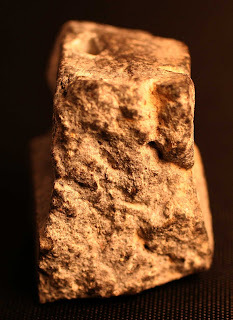 The side shown on the left of the picture was cut with a diamond saw. 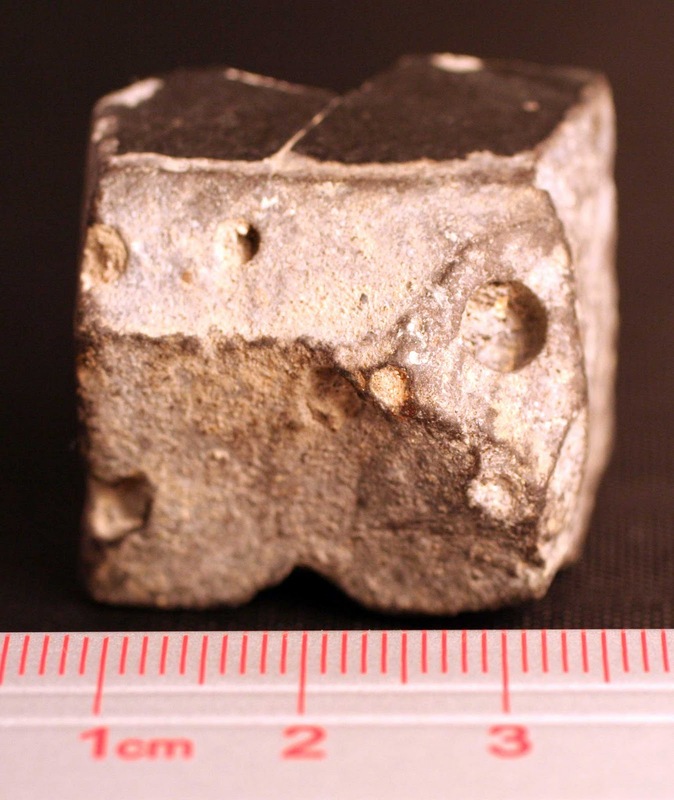 It is almost black after being cut with small holes the size of grains of sand. The water coming of the saw blade turned darker when cutting, reminding me of cutting black New Albany Shale but without the sulfur smell. Some one must of discarded it into the pile or it came off a piece of quarry machinery? I assume with the coating and bubble cavities it was man-made. After a long delay I finally attended a meeting of the amateur fossil-collecting group, Dry Dredgers of Cincinnati, Ohio. Cincinnati is about a 90 minute drive up I-71 from Louisville, Kentucky. Like Louisville, Cincinnati was established on the banks of the Ohio River. Since 1942, the Dry Dredgers have met at the Geology Department of the University of Cincinnati. They also have a good working relationship with the Cincinnati Museum. Their meetings appear to take place on the 4th Friday of the month at 8 PM. This one was held a week early for Thanksgiving. The meeting was well attended with maybe 50 people in a large classroom with multimedia capabilities. I had not been to the campus of the University of Cincinnati before and the GPS got me there. Finding the correct place to park and the Braunstein Hall building took some time. Luckily I asked a couple on the street I parked on if I was in the correct location and they were members going to the meeting. They helped me find the room and get a parking pass for my car. The business section and committee reports are held at the beginning of the meeting. Geology professors report about research or field trips they are involved in. A person from the museum might also give a report as well but one was not present at the meeting I attended. 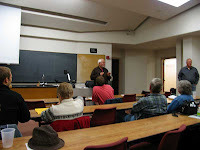 The speaker for the meeting was Terry Huizing, a volunteer curator of mineralogy at the Cincinnati Museum Center and past president of the Cincinnati Mineral Society. His PowerPoint presentation was entitled "Minerals of the Midwestern United States - Ohio, Indiana, and Kentucky". 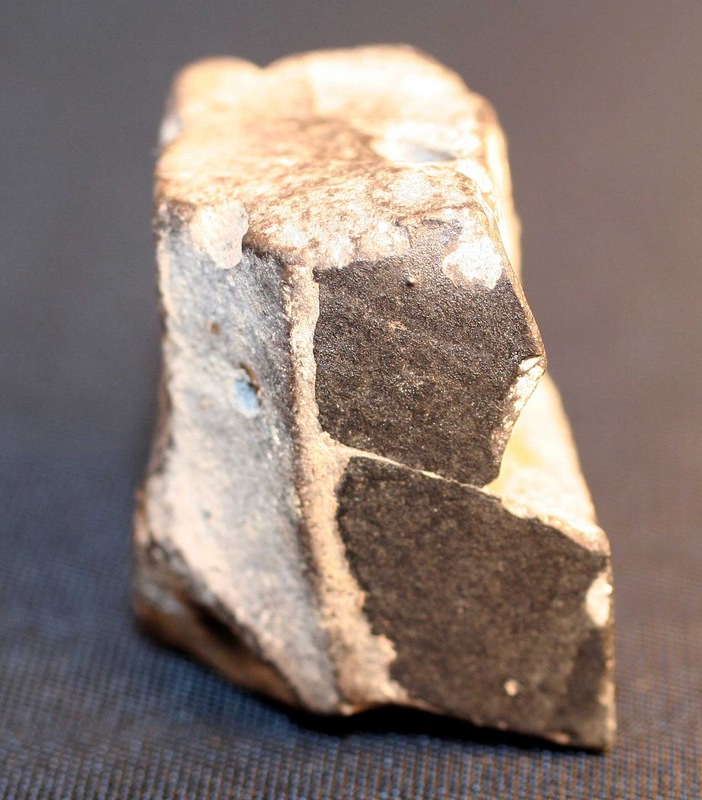 Very impressive photography of specimens obtained from quarries and road cuts in those states. 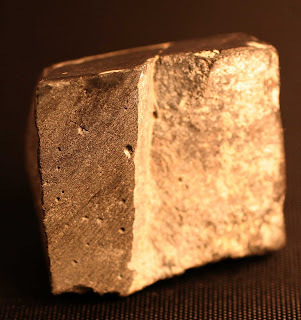 If I recall there were quite a few calcite, dolomite, and pyrite specimens. There might have also been some sphalerite, marcasite, fluorite, barite, and quartz specimens. 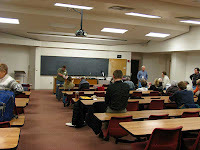 After the main presentation, the formal meeting was over and attendees talked in small groups and enjoyed refreshments in the back of the room. I bought a small book: Cincinnati Fossils: An Elementary Guide to the Ordovician Rocks and Fossils of the Cincinnati, Ohio, Region edited by R.A. Davis, Cincinnati Museum Center (1998). They also give out quite a few door prizes (maybe 10 or so) at the beginning of the meeting. With my notebook computer I showed Mr. Huizing the mineral database application I developed for the Louisville Science Center collection. He told me they use a system that the Smithsonian uses. After giving him a short demonstration, I realized that the interface has some cosmetic issues when using the Chrome browser (normally I test it using Firefox). Also my next demo will be with a Windows 7 notebook that boots a lot faster than Windows XP one. A new option for the mineral gallery feature that shows just the "eye-candy" pieces as opposed to every image in the database. Bill Heimbrock who maintains their excellent web site also creates trilobite replicas sold at the museum gift shop. 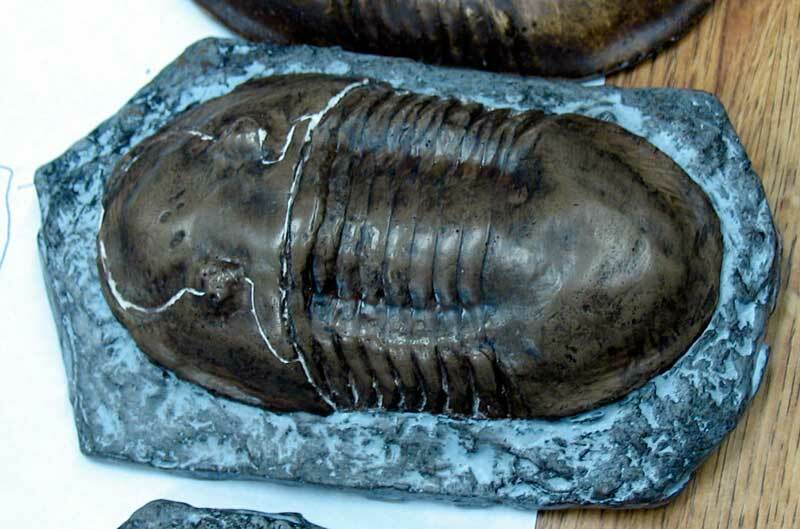 He had a number of Isotelus trilobite replicas on hand created with various plasters and compounds. I tried to get some genus/species identifications for two Ordovician Period branching bryozoans. The people I asked played it safe told me then section would be needed for a positive ID. In addition, I brought Devonian & Silurian fossils found around the Louisville area to show plus minerals (pyrite, barite, fluorite, sphalerite) from Kentucky and Illinois. 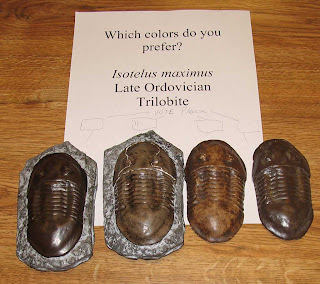 Besides fossils and minerals, the river snails shells (highlighted in this blog entry of November 15, 2010) were with me. An attendee told me the snails are indeed edible. The brachiopod with a partially exposed lophophore attracted the most attention of the items I brought (see picture in November 18, 2010 blog post). My impressions of this group: the members I encountered were very friendly. They have a strong academic presence and a number of younger members. Researchers and professors at the university utilize fossils found by the group in research papers. Ohio has an impressive set of academic geological resources that Kentucky does not (at least in the Louisville area). 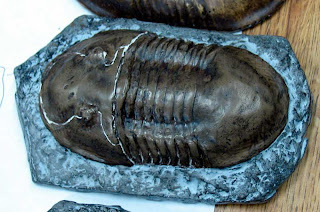 I hope to return for another meeting in 2011 and next time take some nice Ordovician finds to show. The drive is not bad but I did not return to the house till 1 AM. One has to be careful driving I-71 this time of year because of deer.